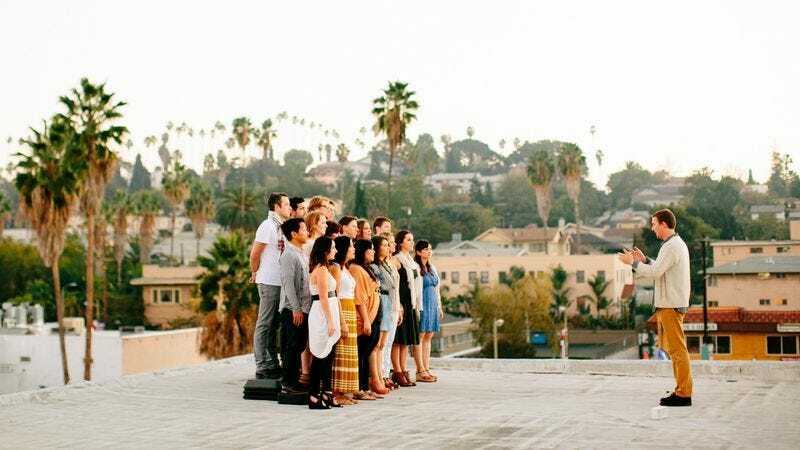 The Silver Lake Chorus teams up with Justin Vernon for an angelic look at L.A.
Indie rock choruses churning out a cappella covers of Blur and Radiohead are a dime a dozen in major cities, but The Silver Lake Chorus is different. The L.A.-based group teams up with well-known songwriters like Sia, Aimee Mann, and Ben Gibbard for unique and new compositions based entirely around the human voice. Below, The A.V. Club has the premiere of music video for one of the group’s most haunting collaborations, “From The Snow Tipped Hills,” which was penned by Bon Iver’s Justin Vernon. Sparse and airy, the track is fairly true to Vernon’s form, but is brought to a more angelic level with the chorus’ harmonies. And the video, which was shot by Eli Goldstein and Clay Folden, captures a drone’s view of the Silver Lake neighborhood in Los Angeles. The Silver Lake Chorus’ next show is October 26 at L.A.’s Hotel Café. Tickets are available now.